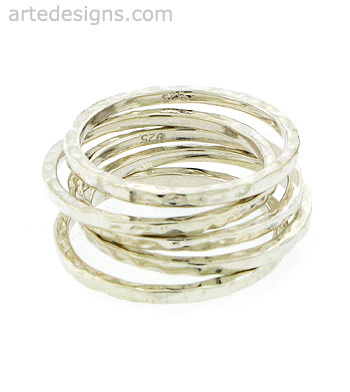 Sterling silver stack rings are a must-have! So comfortable and fun, you'll never want to take it off! Wear one ring only or stack up as many as you want on as many fingers as you want. The combinations are endless and will instantly dress up your finger/s. Sparkly, hammered rings are made entirely of sterling silver and have a nice weight. Also available in other sizes. Each ring is sold individually (not in a stack), so feel free to mismatch sizes. Size 6. Be aware, sterling silver scratches easily and should be worn with care (as should all rings).